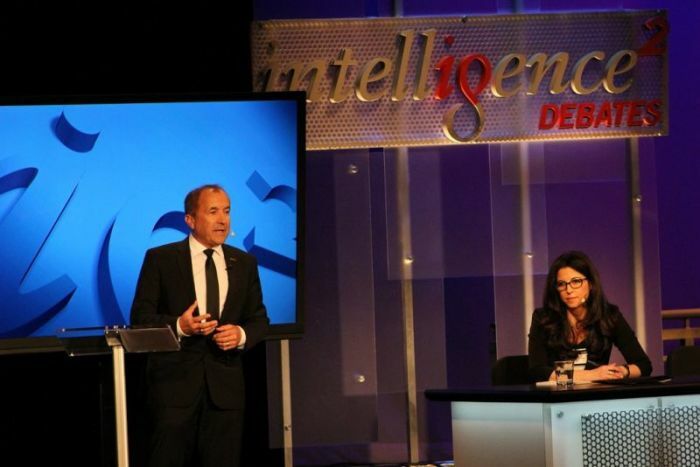 NEW YORK — At an Intelligence Squared debate attracting approximately 600 people at The Kaye Playhouse at Hunter College Tuesday night, most people were convinced by arguments that "The More We Evolve, the Less We Need God." Arguing for the motion were Heather Berlin, a cognitive neuroscientist, and Michael Shermer, founder of The Skeptics Society who is also a best-selling author. Berlin also serves as assistant professor of psychiatry at the Icahn School of Medicine at Mount Sinai and practices clinical neuropsychology at Weill Cornell Medicine in the Department of Neurological Surgery. Arguing against the motion were two doctors. 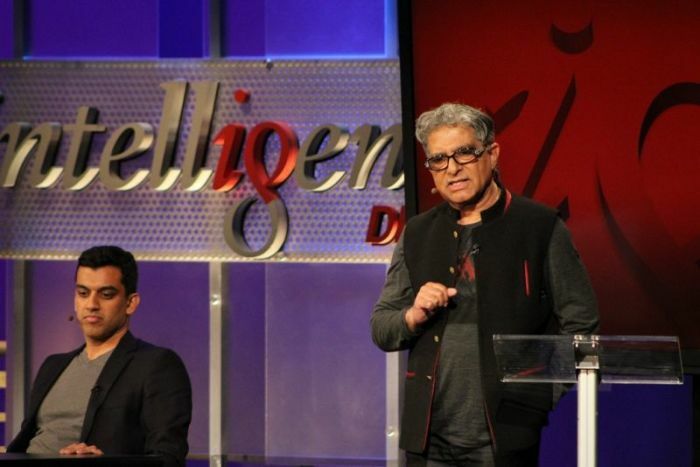 The world-renowned Deepak Chopra, a popular New Age author and speaker, and Dr. Anoop Kumar. Kumar is a board-certified emergency physician practicing in the Washington, D.C., metro area, where he also leads meditation gatherings for clinicians. Before arguing in support of the motion, Berlin noted that she was raised Jewish culturally and she is still "open to the possibility that there's some higher creative power in the universe, some benevolence that I can't quite comprehend that might deserve the name God." She quickly warned the audience, however, that they weren't debating the existence of God. "We're not here to debate whether God exists. We're here to debate whether God is becoming less needed as humanity evolves. And, however we measure that need, whether it's a need for explanations, a need for comfort, or a feeling of belonging, or just to give us a higher sense of meaning or purpose, the answer is clear. The more we evolve, the less we need God," she said. Berlin, who said her interest in neuroscience was sparked at the age of 5 when she decided she wanted to know where her thoughts came from, then explained what it means to evolve and how evolution has led to the debunking of some religious dogma. "We're not talking about biological evolution or changes in gene frequency. We're talking about cultural evolution, or just the development of humanity. "And scientific progress over the past several hundred years has completely transformed our knowledge of how the world works. And each major scientific breakthrough has had to overturn some religious dogma, right? So we've gone from believing in special creation to an understanding of how all living things descend from a single common ancestor by blind trial and error process — natural selection," she said. "We've gone from believing that diseases were curses caused by evil spirits and bad karma to an understanding of the deep mechanisms of disease at the cellular and molecular level. But we still live in a world where people reject life-saving medicine on religious grounds. Just the other day, there was a news story about a 2-year-old boy who died because his parents chose prayer over medical treatment," she continued. "The more our understanding evolves, the less we need God. Now, using God to explain natural phenomenon is an argument known as 'God of the Gaps.' Throughout history, if there was a gap in our understanding, it was by default to say God must explain it. But the more science illuminates our world, and gives us a real understanding, the fewer gaps are left for God to inhabit." She further argued that consciousness cannot be God because consciousness is what the brain does. "Now, my own field, neuroscience, 350 years ago, Rene Descartes had argued that our perceptions had to be accurate because God would never deceive us. And our brains were made of physical mechanisms, but our conscious minds are an immaterial essence, a spirit that interacts with the physical brain through the pineal gland. But today, neuroscience is revealing that Descartes was wrong. Our perceptions are biased and inaccurate, which may explain the persistence of supernatural beliefs. And consciousness doesn't interact with the brain. Consciousness is what the brain does," she argued. Berlin noted, "There's no reason to believe that consciousness existed before brains existed," because "now, some people think they've experienced God directly, with or without drugs." "Neuroscientists can now induce religious or transcendental experiences by stimulating specific brain areas with powerful magnets, giving people out of body experiences and sensation with oneness with the universe, not to mention hallucinations that would rival the Book of Revelations. So, the more our understanding of the brain evolves, the less we need God. And evolutionary and cognitive psychology are also helping to explain the origins of our need for God, for comfort, morality, sense of belonging, and why that need is diminishing," she argued. She later pointed to countries like Denmark and Sweden where the majority of people are atheist yet their societies are "high-functioning and relatively free from suffering." This is an indicator she said that "living without God is fully compatible with human psychology, as long as the need to make sense of the world is satisfied by science and our need to belong is satisfied by our social networks and communities." "If we're aware of the fact that people tend, on average, to turn to God less often when they feel safer, happier, healthier, and more stable, then we have to admit that the motion is correct: the more we evolve, the less we need God," she said. In his counterpoint, Chopra, who introduced himself to the room explaining that he was still figuring out who he is, said that the collective consciousness of the universe is God and evolution cannot occur without the presence of consciousness. "When we speak of God, we are not talking about an imagined deity," Chopra said. "We're talking about the consciousness in which all experience occurs. And we're defining consciousness in very precise ways .... You cannot imagine consciousness. You can't imagine God, because if you imagine God, then it's not God. The infinite cannot be imagined. But without consciousness, there is no imagination," he explained. "If consciousness is God, then we need consciousness to evolve. Why? Because, as Heather said, right now we're not talking about biological evolution. We are talking about what I would call metabiological evolution, the evolution of our consciousness and ultimately the evolution of the consciousness of our consciousness, because the key to consciousness is self-awareness. God is our highest instinct to know ourselves," he added. Shermer argued, however, that the notion that God becomes more irrelevant as society evolves is supported by overwhelming evidence from evolutionary theory, history, and the social sciences. "I contend that our starting point is the survival and flourishing of sentient beings — that's us and other animals — and the central problem with group living. We're a social primate species, the central problem with group living is trying to figure out how to get selfish genes that build these survival machines that just want to have, maximize their own utility or benefits to cooperate with other survival machines built by selfish genes," he said. As a result of this situation, Shermer explained, tribalism evolved into larger state rule about 10,000 years ago and the concept of God and government were technologies used to manage these larger societies. "So, government basically gives everybody a copy of the rules and says, 'These are the dos and don'ts, and here's the penalties if you violate them.' Of course, there's not sophisticated police systems at the time. So, people got away with it. But you don't really get away with it, because there's an eye in the sky that sees and knows all that you're doing and can impose punishments in the next life," Shermer said. "So, this is God or religion. So, for thousands of years, it was kind of a toss-up between anarchy of having no state or government organization, and tyranny — having either oppressive governments or religions oppressing their people," he explained. It was the Scientific Revolution that came about 400 years ago he said that "discovered that the universe is knowable and that it's governed by natural laws that we can discover and understand." "In the Enlightenment, there developed a number of theories about how best we should live with one another .... And that led to pretty much most of the moral progress we've made over the last several centuries," he said. "The abolition of slavery, and torture, the death penalty, the death increase in civil liberties and civil rights, the expansion of the moral sphere, the bending of the moral arc, if you will, toward greater justice for more people in more places, more of the time, I argue, has primarily been the result of science, and reason, and these Enlightenment values like natural rights — not the function of religion or belief in God," he said. He then cited a study on the religiosity of 20 different leading democracies in the Western world which found that the more religious a country was the lower that country ranked in societal health, which measures things like homicides, suicides, abortions, STDs and general life satisfaction. "Well, you can't believe this, but it turns out that the higher the rates of religiosity in a nation, the more people believe in God in a nation, the worst they score on these indices of societal health. And America stands out by far, with no one even a close second, as the most religious of the Western democracies and the worst on all of these," he said. "If religion and belief in God is such a great force for driving moral progress, how come it fails so abysmally here and every other nation where religiosity and belief in God is high?" he asked. In arguing against the motion Dr. Kumar declared that "nobody has ever perceived anything outside of consciousness." "That means every experience, including space and time, is in consciousness. So, history, philosophy, music, art, literature, you name it, it's in consciousness .... Not only is consciousness infinite, but the infinite has always been the ultimate description of what we call God," he said. "The more common notions, the more familiar notions, and all the notions that were spoken about by the opposing team, they are aspects of God. So, there's infinity, but then we talk about infinite wisdom, infinite compassion, infinite mercy, infinite understanding. These are aspects of infinity. And this infinity shows up, not only in religion, but it shows up in mathematics, and philosophy as different aspects, different approaches," he argued. "So, the ultimate god of religion, not the different forms of God; it's not the particular names of gods, which are the varieties we see that depend on the human mind that conceives them, but the ultimate God ... shows up in mathematics as infinity. It shows up in philosophy as truth. It shows up in science as the reality behind science. It shows up in all experience, in every experience, as consciousness," he said. 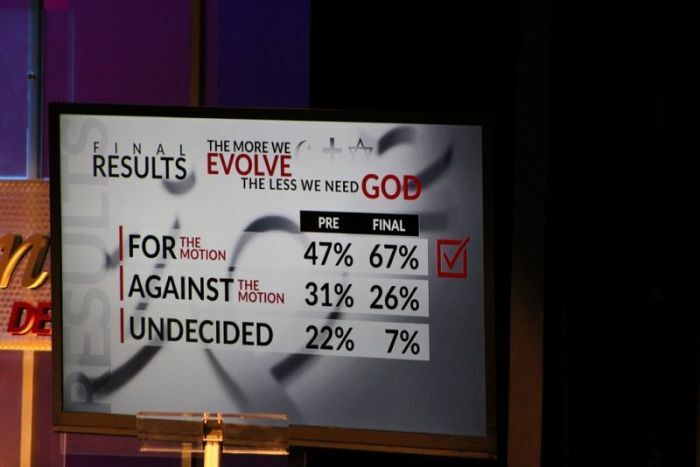 Before the debate, 47 percent of the audience was for the motion. After the debate, 67 backed the motion. Are Atheist Chaplains in the Military's Future?